A growing number of dog owners are turning to cosmetic surgery to improve the look of their four-legged friends. Popular treatments, which can cost in excess of $10,000, include face lifts, tummy tucks, teeth straightening procedures, eyebrow corrections and even Botox injections to smooth out wrinkles. There are also silicone testicles produced by Neuticles.com, so that neutered pooches can retain 'their natural look' and 'self esteem'. 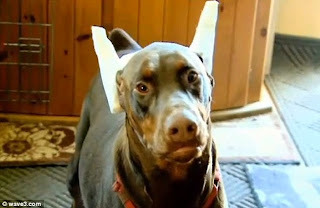 Heather Hughes from Los Angeles, California said she decided to pay for her Doberman, Kaiser to go under the knife because his ears were too floppy. I do not understand how someone could do this to an animal they are supposed to be looking after and should care about. There is no animal that would actually want to have themselves operated on for superficial reasons - this particular vanity and lack of perspective is unique to the human species. Sure, animals in the wild often have elaborate mating rituals in which their appearance plays a role - that does not mean that we should impose our own body image issues onto them. We live in our own bubbles of what we think life is, what we think reality is. We see the world through our interpretations, which are based on belief systems, level of education (reading and comprehension, as well as vocabulary are the main skills that determine one's level of education - ie information absorption and understanding), culture, societal influences, and parental influences. We do not see the world as it is. First, we apply our filters, or Bias Goggles. These Bias Goggles enable us to look at a simple item and turn it into something completely weird and irrelevant to it's actual nature and/or purpose. Take, for example, a common household item such as a cup. This cup is simply something in which to put liquids which we then drink out of - BUT when wearing our Bias Goggles, this cup will appear to be something completely different, like a representation of love, anger, wealth, poverty, effort, or whatever. You know what? A cup is just a cup. Our Bias Goggles can be used in any setting. We could watch the news and see some grizzly scene of horror and not be driven to act, or even feel anything. Our Bias Goggles have evolved to the point where we can justify cruelty and torture by saying that everyone is entitled to their opinions (Bias Goggles) - because we don't want to lose our own Goggles. We want to carry on seeing the world and ourselves the way we want to see it as opposed to how it actually is. We want to think that dogs care about how pointy their ears are. We want to not think about all the atrocities happening in the world on a daily basis. We want to think that love and a white picket fence, or fame and fortune, are the most important things in the world. We want to think our own happiness is more important than changing the world on a large and positive scale. Why would we ever give up our Bias Goggles anyway? If we did that we would have to look at everything we have done and allowed in the name of me, myself and I.